The Illinois Street Multimodal Bridge, crossing Islais Creek Channel between Pier 96 and Pier 80, provides on-dock rail to the Port of San Francisco’s cargo terminal at Pier 80. It also serves as an alternative route for trucks leaving the cargo terminals in the southern part of the city, and offers a pedestrian crossing. Intersection geometry, striping, and signal coordination were major challenges due to local access needs and the adjacent intersections of Third and Cargo to the south and Third and Tulare to the north. CHS Consulting Group served as the Traffic Engineer for the design-build team. 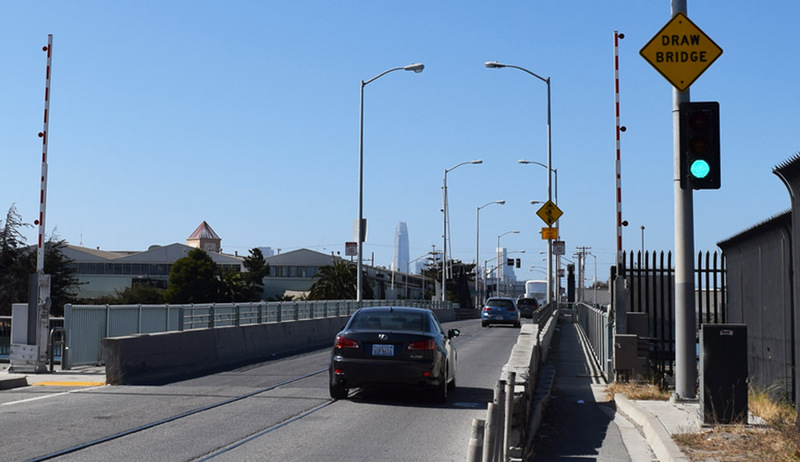 CHS’s responsibilities included preliminary and final design of intersection geometry, as well as traffic signal plans at the intersections of Cargo Way and Illinois/Amador Streets, and Marin Street and Illinois Street, and coordination with the freight rail signals. CHS also developed the design and specifications for the street lighting system. The project has been completed and is now in operation.